One reviewer thought that Norman Deck’s landscapes were ‘the very essence of Arcadianism’.1 It is arguable whether his imaginative view of the landscape was Arcadian. Living simply in the Pacific, he would return to Australia and lament the devastation wrought on the environment by ‘progress’. It was this love of the unspoilt and untamed which was the source of his attachment to New Zealand. He had spent six months there as a boy and made extended trips around both islands in 1909, 1911 and 1921, photographing extensively. He thought the photographs he took from McKinnon Pass to Milford Sound were some of his finest. Many of Deck’s non-landscape subjects were depictions of figures on the beach. 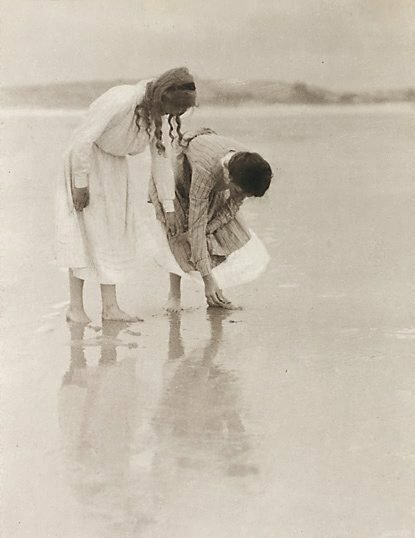 Although he had painterly models for this work, such as William Margetson’s popular ‘The sea hath its pearls’ 1897 in the collection of the AGNSW, the simplicity with which he handles a potentially contrived subject, the quality of light and his straightforward photographic approach make this one of his most distinctive and memorable images. Not signed. Dated l.l. board, pencil and c. verso board, ink "...1909".